n. In Jewish folklore, an artificially created human supernaturally endowed with life. Suppose you had the power to create a being of immense strength, totally obedient to your commands. The being itself would want for nothing, in that it would need neither food nor drink, nor sleep, nor, seemingly, would it desire anything or anyone. It could be gentle as a kitten, or an unstoppable destroyer, directing its force toward whomever you wished. To what use would you put such a juggernaut? A saintly person wouldn’t create such a creature in the first place. A despicable person would create one ASAP, then set about exploiting its full destructive potential. 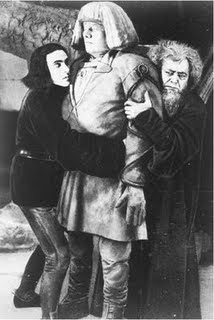 But most people, I think, would fall somewhere in between these extremes, as does Rabbi Löw (Albert Steinrück), the 16th-century Czech protagonist of The Golem. Löw did not attain his status as de facto head of Prague’s Jewish Ghetto by taking situations lightly—he fully appreciates how serious a situation must be to make the creation of a golem even thinkable. Only when faced with the worst possible challenge: an Imperial edict commanding the Jews to leave the Ghetto, does Löw make his way down to the catacombs beneath his community and begin fashioning a man of clay to become its defender. This is noble intent, for which his people are grateful. However, the Rabbi has problems like anyone else, too. He’s got groceries to buy, and only one puny servant, already busy, to fetch them. And then there’s his pretty daughter, Miriam (Lyda Salmonova), who’s rather too fond of male attention. Boy, it’d be nice to have someone watching her back! Someone who wouldn’t pay so much attention to her front. Rabbi Löw’s solution proves to be more of a labour-saving device than a saviour. Fittingly then, The Golem turns out to be something much different than the horror film its Expressionist sets and Gothic theme imply. 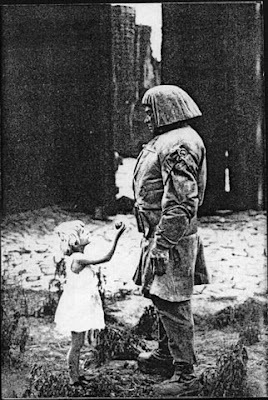 The Golem is, in fact, a dark comedy—one of the funniest silent films ever made. The destruction of a Jewish ghetto would be unlikely grounds for a comedic film after 1945 (maybe even after 1933), but National Socialism, thankfully, was still a few years away for German artists like actor-director Paul Wegener. 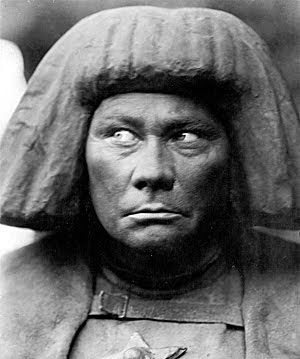 Having already produced a pair of golem-themed films in the previous decade, Wegener ushered in the 1920s with a fanciful masterpiece: a movie populated with thick and dusty tomes, ancient scripts and deadly spells, smoking censers, candelabras, and angular, twisting buildings, tapering to tilted tops and filled with funny-hatted citizens who greatly resemble them. Nothing reduces a powerful man like a funny hat; especially if he doesn’t know how silly it looks. In this regard, the citizens of the Ghetto are matched, then exceeded by the nobles of the Emperor’s court, and none more so than the Knight Florian (Lothan Müthel). Florian is a shallow, self-important twerp (placing him well within the bounds of a German silent film protagonist, by the way). That he’s the one chosen to deliver the Emperor’s message to the Ghetto says way too much about the Emperor. Florian trots his way to the Ghetto on horseback, bedecked in a hat with a three-foot feather atop it. He delivers his devastating message to the Jewish elders as though it were almost too boring to bother with. Only Miriam can hold his attention, and Löw isn’t thrilled about that. Such stress—you can’t blame Löw for resorting to a golem. Deep beneath his craggy dwelling he smacks and squeezes a mound of clay into human resemblance. The resulting statue is coarse-featured, burly and barrel-chested, with a heavy overcoat and belt, though these clothes too are part of the sculpture. The statue remains inanimate, as Löw must still affix to it a pentagram-shaped amulet containing the ‘life-giving word.’ Löw doesn’t know the word, but he knows a spell that will compel the dreaded spirit, Astaroth, to reveal it. Löw and his assistant encircle themselves with a magical fire and conjure Astaroth, who appears as a disembodied head, spewing smoke. The demon delivers the word, which Löw transcribes on a piece of parchment and places within the amulet. He then presses the amulet into a receptacle in the statue’s chest. Instantly, the Golem is alive. Just like that. Like, if you switched on your vacuum cleaner—like that. His eyes pop open and Löw and his assistant back up in the same moment. And with this scene, The Golem turns from potential Horror to realized Comedy. It could’ve gone either way. I’ve always felt the scariest horror films are those that adhere to logic—if the monster is plausible (or at least, acts plausibly within the bounds of the film’s reality), we can better identify with its victims. The Golem’s creation is certainly logical—it is an automaton plugged into its power source, and why shouldn’t it simply ‘switch on’ as any other appliance would? Consider, however, that the Golem is being imbued with Life; an act hitherto attributed only to The Lord, and one for which Löw must either be considered god-like himself, or terribly sacrilegious. If the film were to follow this thread (as, for example, director F.W. Murnau did in his 1926 Faust), it would require some degree of solemnity. Yes, Wegener provides us a batch of special effects before the Golem is born, but the birth itself has no lightning bolts, thunder or scientists shrieking ‘it’s alive!! !”—and we need that. Löw’s scowling, speechless man of clay is on-side right from start. But the Imperial Court hasn’t sent its troops to the Ghetto just yet, so in the mean time, the Golem (played by Wegener) might as well be made useful. And thus the assistant has him chop wood and man the bellows for the house’s stove (he never gets tired, after all). Löw sends him to the local grocer (whom he terrifies) to pick up a few things. Curious onlookers peek out of their off-centre, Expressionist windows to watch the giant lumber through their streets in broad daylight. Sadly, astrology is a fickle thing. Uranus enters the House of the Planets, and the Golem turns violent, committing several assaults and causing at least one house fire. It’s still a net-gain for Löw, though, as the Golem’s rampage leads to the conclusive dispatch of Florian. The Golem’s own story ends in far more poetic fashion. That ending, which is too wonderful a surprise to reveal here, proves a testament to Wegener’s gifts as a social satirist. As a comedic conclusion, it’s perfectly paced. Most importantly, however, it is in keeping with The Golem’s core message: Among the mighty, there are many with feet of clay. Der Golem: wie er in die Welt kam (The Golem: How He Came Into the World) is distributed on DVD by Kino International. The disc (one of Kino’s finest, in my opinion) includes a crisp, tinted print of the film, image galleries, an excerpt of Julien Duvivier’s 1936 film: Le Golem, and, for comparison’s sake, excerpts of the ‘conjuring scenes’ in Murnau’s Faust and Chayim Bloch’s book, The Golem (1925). I enjoyed this movie too, although I thought you could have mentioned that it was actually the 3rd Golem film - Der Golem (1925) and Der Golem und die Tänzerin (1916/17 (depending on what source you quote)) both being regrettably lost. I loved the Expressionist touches, especially the staircase design to look like a shell and the overbearing walls. I agree with you also the the "birth" seemed too easy - although perhaps it appears that way to our eyes, jaded down through the decades. And also the Golem's "death" being too easy - it reminded me of Lost In Space and how ridiculously easy some of their cliffhangers would resolve. Perhaps is would have been better if we saw the inert Golem crumble away to nothing, but then Wegener needed to have the Golem's body to survive - seeing how this film was a prequel to the original Der Golem. Or perhaps special effects weren't as advanced in those days to pull off that shot. Regardless, a brilliant example of German Expressionist film.